Rumor has it Apple's next smartphone will pack a sapphire display, but it looks like the iPhone 6 won't be the first handset to feature the super-tough material. 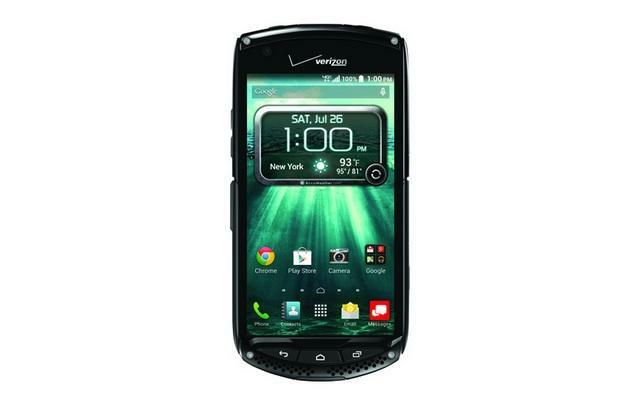 Earlier today Verizon announced the Kyocera Brigadier, a new Android handset boasting, you guessed it, a sapphire display. The Brigadier is available starting today for $99.99 with a two-year contract from Verizon, and it should start popping up in stores later this week on Aug. 7. The device packs a 4.5-inch HD display that Kyocera claims is "virtually scratchproof," a 3100mAh battery, 16GB of storage with microSD support, an 8-megapixel rear camera and a 2-megapixel front-facing camera. It runs Android 4.4 KitKat, and like most of Kyocera's durable phones it should be able to survive pretty much anything you throw at it (or throw it at) from extreme temperatures to being submerged in water. Apple still hasn't confirmed the iPhone 6 will use a sapphire glass display, though recent leaks seems to support the rumors. Still, the sapphire used in the new iPhone is likely to be a blend of several different materials, meaning it won't be quite the same as what Kyocera's offering today. The Brigadier looks to be one tough smartphone though, so if you're not very good at protecting your devices this may be the phone for you.